Certain streaming services will function more reliably if you block specific IP addresses on your router. This guide will show you how to block specific IP addresses on Huawei routers, using two Google DNS server addresses as an example (8.8.8.8 and 8.8.4.4). To block specific IP addresses on your Huawei router, you’ll need to set special routing rules. These rules ensure your network traffic will not flow through the IPs you specified. 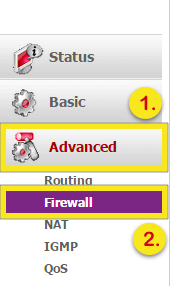 In the “Router settings” page, go to Advanced and select Firewall. Some other routers show IP Filtering under the “Advanced” tab. Choose the Firewall level you just created ( “google”) then select IP filtering. On the right, click New then enter 8.8.8.8. Click Submit. Repeat the above but enter 8.8.4.4 instead. The ping tests should fail (returning errors such as “Timed Out” or “Destination Host Unreachable”). If you get a response, check that you have performed the steps above correctly. If the problem persists, reboot your router and repeat the steps.